I have been practicing dentistry in Livermore part time in order to raise my small children. I started 25 years ago. They’re not small anymore. So, it was with great delight this past February that I opened the next chapter in my life…the full time practice of dentistry in my own facility in downtown Livermore. The planning and construction of this office, itself unfolding over 2 years, required immense coordination of the smallest detail. My goal was to build an environment that is not only comfortable and serene to work in, but also to receive dental care in. I believe that I was successful. Please stop by and let me know if you agree. The office boasts panoramic views of Mt Diablo, Morgan Territory Park, and Brushy Peak. The northern light from those windows provide the ideal conditions for the shade matching of teeth. An illumination engineer designed the ambient lighting not only to be perfect for my exacting demands at chairside, but also to be soft and gentle on the eye throughout the entire office. The colors, the layout, and the overall design complete the visual package thoughtfully. But there is always more than meets the eye. State-of-the-art equipment was installed. I use digital x-rays, minimizing patient exposure and eliminating chemical processing. Networked work stations in every room are facilitating another goal of becoming paperless very soon. The patient chair sets the industry standard for comfort. Hidden within the walls are conduits and wires waiting for the installment of future equipment that has yet to be invented. I am prepared not only to offer state-of-the-art services now, but to continue to offer them in the future as they become available. The physical facility, however, is only a reflection of my practice as a whole. Within these walls, my patients benefit from proven expertise and judgment, honed from 25 years of my own experience and mentored by my father, himself a dentist of nearly 50 years, comfortably blended with cutting edge skills gleaned from many different sources of current continuing education classes. My staff is warm, thoughtful, and skilled. 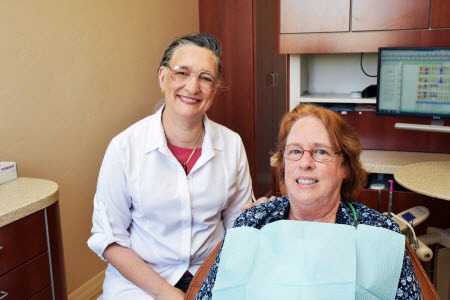 We work together to provide our patients with the customized care that is just right for each one, from answering questions about concerns, to implementing the correct treatment, to helping with insurance matters, and more. So please, call or e-mail my office so we can start at the beginning…answering the questions that you have.